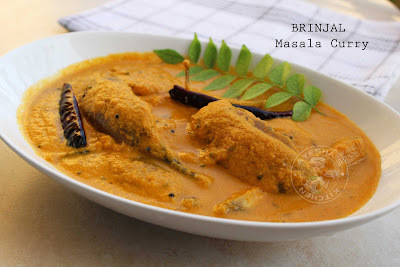 Today's recipe is with eggplant/brinjal / vazhuthananga / baigan. 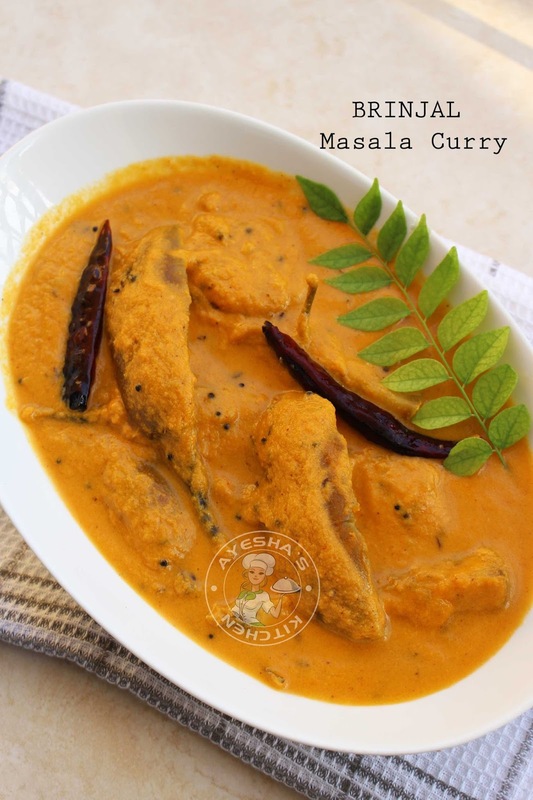 A very easy curry served along with rice and can be prepared within minutes. Brinjal is my husband's favorite veg, but for me, it is just opposite. So all the time I used to prepare brinjal masala fry or stir fry so that i can adjust somehow. Yesterday he asked me to prepare an eggplant masala curry same like my Goan fish curry. At first, i refused but later unwillingly i just prepared. It was a great day for me as the dish tastes better than fish curry. For the first time, i fell in love with brinjal/egg plant. So friends, those who hate the taste of brinjal, please try out this recipe. Sure, damn sure...u will crave this more. Try this recipe and do let me know the feedback. Here is the recipe for eggplant masala curry/brinjal masala curry / vazhuthananga masala curry. Soak brinjals in salt water for 10 minutes if possible and then slice each brinjals into 4 equal parts, lengthwise. Prepare the masala paste by grinding together onion, tomato, ginger garlic paste, coriander powder, turmeric powder, chili powder, coconut grated and salt to a fine paste. When done marinate the brinjal slices with the ground paste . Now heat a vessel with some oil and splutter mustard seeds, cumin seeds and when done, add the marinated brinjal along with the masala. Close the vessel and cook for 10 minutes. When done add the thick coconut milk and mix well. Let it cook for few minutes in a medium flame until brinjals are cooked well. Serve with hot rice..its really a great gravy. truely its awesome.